The run up to the Sachsenring MotoGP will be remembered for the spate of crashes that took place on track in the Free Practice sessions. While it was Yamaha rider Jorge Lorenzo who topped the first free practice session, the Spaniard crashed heavily in Free Practice 2, further injuring his already broken collarbone. Lorenzo wisely decided against taking part in the rest of the weekend and flew home for surgery, rest and recuperation. Then it was the turn of championship leader Dani Pedrosa, who suffered a highside in Turn 1, landed heavily on his shoulder, before sliding across the track and into the gravel. Pedrosa was seen reaching for his collarbone, as though in pain. Further examination revealed that the rider had a concussion and also had a cracked collarbone, putting him out of contention for qualifying. If Pedrosa is deemed fit enough to race, however, he will start from 12th on the grid, his position already having been determined by his performance in Free Practice. With Pedrosa and Lorenzo out of the way, the Sachsenring was left to Marc Marquez, Cal Crutchlow and Valentino Rossi. And the three of them took complete advantage of the situation in a qualifying session that saw Marquez gain a tenth over provisional pole man Crutchlow at the very end of the session. The 20-year-old rookie from Spain set a time of 1 min 21.903 secs. Crutchlow set a time of 1 min 22.129 secs, ahead of Valentino Rossi with a timing of 1 min 22.306 secs. While it was Marquez' third pole of 2013, for Rossi the front row start has come after a very long wait. The last time The Doctor started on the first row of the grid was at Estoril in 2010. What can we expect from the race tomorrow, then? There's no doubt that Marquez has speed on his side and a good start from pole could mean he'll lead the race into Turn 1. But Crutchlow will put up a decent fight too. As for Valentino Rossi? 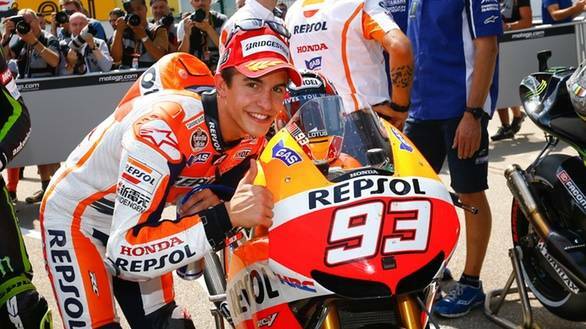 After winning the race at Assen, it's a confident Vale that is turning up at the racetracks. Rossi will be eager to make the most of the front row start and we see him challenging for another win. And a win will put him right back in contention for the championship. We wouldn't miss this race for anything in the world!